The village of Weobley dates back to Medieval times, when it developed as a prosperous market town and wool trading centre. However, due to its lack of transport links (no canal or railway connections), the village became isolated during the industrial revolution, failing to grow or develop further. This isolation and lack of development has ensured that many of its 15th~16th century timber framed buildings have remained virtually intact over the centuries, providing the village with a rich heritage of such historic properties, making Weobley a veritable Jewel in the Crown of the Black and White villages of Herefordshire. 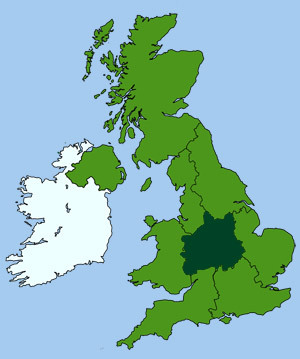 This peaceful and picturesque village lies in the heart of Herefordshire's rich agricultural pastureland, surrounded by rolling hills and beautiful countryside. Voted in 2008 as one of the top fifty best places to live in England, Weobley is an idyllic place to visit and forms part of Herefordshire's 'Black and White Village Trail'. In fact the village contains its own unique Heritage Trail, with information plaques placed at appropriate points. The trail explain the various historic buildings and their architectural features and how they were used in days gone by local cottage workers and medieval traders. For those interested in visiting the village and taking the Heritage Tour, a trail map is available to download from the village. In addition, a useful MP3 audio guide of the tour, recorded by BBC presenter Mary Rhodes, can very soon can be downloaded from the same site. For visitors without internet access, a large map of the village is provided at a the village's central Information Point, which shows the locations of each of the 19 information plaques and also relates a brief history of Weobley, plus an introduction to its historic timber framed buildings. Visitors can also enjoy lunch and refreshments at one of the many excellent restaurants, inns and tearooms in the village. Those wishing to stay longer and fully experience the historic atmosphere can book a room in one of the many old guest houses around the town. 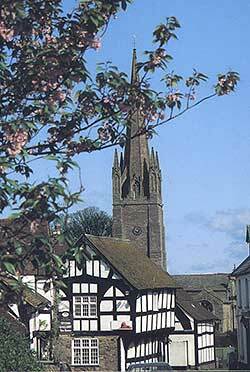 Weobley's parish church has the second tallest spire in Herefordshire. See image above. Located on the site of the old Court and Police Station, this small museum tells the story of Weobley's early history and provides an interesting insight into the construction of the village's many Black and White houses and the traditional art of oak timber framing. The extensive earthworks of an 11th Century motte and bailey castle can be seen to the east of the village.